50th Post!!! The Adventure So Far… | Guten Morgen Berlin! March 16, 2011 - Guten Morgen Berlin! At our Kita, we pride ourselves on keeping your children as safe as possible. 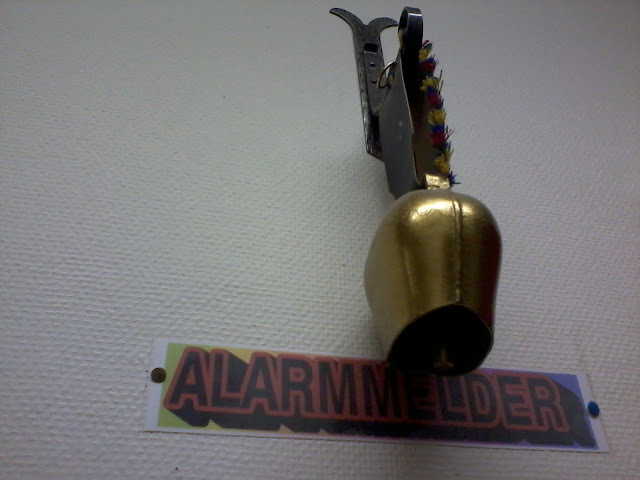 Therefore we only use the largest and most ostentatious Alpine cow-bells in our fire alarm system. Wow, we have reached our fiftieth post on Guten Morgen Berlin and I am so pleased with the way it has gone so far. The number of readers per post is more than ten (by a somewhat considerable amount), which was my secret hope for this project at the beginning, and I have kept it going and not allowed it to pathetically shrivel and die like a LiveJournal. I have now been in this city for seven whole months, give or take a few days here and there for toddler-detox, I have witnessed it struggling through two seasons, one meltdown and a variety of minor panics. I have lived, spoken, shopped and eaten like the natives (excepting the daily Wurst) and deeply enjoyed all the little peculiarities and differences between big burly Berlin and drab twee Britain. What are my conclusions thus far? First of all, that you clearly need to live somewhere for a good few years before you can even start to get used to everything to the extent that you feel fully ‘at home’ there. God knows it is so much fun to discover all the idiosyncrasies from day to day; I mean, look at the photo above. This Kindergarten genuinely has a cow-bell as its alarm system. There are great sweeping realms of things here that I think you have to be a German from birth to understand: sweetcorn flavoured joghurt, currywurst pretzel-pizzas, Berliner Weisse (a pale beer which you drink with either a radioactive green or acid pink syrup mixed into it and which I first saw being drunk by a troupe of nuns), or the inexplicable way that the most revered and famous institution in the whole city is the Blue Man Group. However, for every time I find myself standing open-mouthed in Aldi wondering at who would want to buy an electric stomach-toner as part of their weekly shop, there are moments where I realise quite how much of this culture I have already taken on and become a part of as much as they have become a part of me; the crazy rainbow-spectrum of fruit and herb teas, the pyromaniacal need to have candles everywhere all the time, the innate knowledge of exactly which supermarket I will need to go to for every specific thing I need to buy, a profound love of Kartoffelknödel…As strange and new as everything still seems every single day, I somehow feel like a member of the club now rather than the bespectacled and square inspector wandering around with a clipboard. – Marmite. Oh, Marmite. You deep brown glossy goddess of toast. How I long to savour your salty deliciousness on my bread and adorning my Ryvita. I yearn to crown you with cheddar, stir you into my chile con carne or tentatively drizzle you into simmering minestrone. I resent that you cost about 7 euros a pot here, and no amount of heinously nasty Brotaufstrich (odd and oily purees designed to go on your daily Brötchen) will replace you. – The colour green. I am pretty sure this exists, as I seem to vaguely recall it in the dark abyss of my memory, but there is no evidence of it as yet here in Berlin. Ever since The Great Freeze this winter everything has been a uniform shade of graun (grey-brown) and this makes even the cool and edgy graffiti look less like anarchistic celebrations of artistic freedom and more like a million dingy charity-shop window displays of dead people’s clothing. This weekend my dearest mother was visiting, and I took her to the Botanical Gartens since the weather was for once pleasant enough to allow scarf-free outfits; the gardens could not have looked more dead, the turf brittle and grimy and the trees contorted and cracking from what they had suffered through. Perhaps spring will come soon and I shall see living plant life again before I leave. I shall keep on sacrificing small animals at the altar in our Hinterhof and see if this helps. But of course this is all small fry and the things I am looking forward to seeing again are nothing compared to that which I will miss. The things that you first of all learn to live with and then learn never to live without, and the things that never stop giving you pleasure and hope regardless of how tired or homesick you are. – The frothing swathes of flowers spilling onto the pavement from the hundreds of florists all over this city. – the public transport system. Germans will deride this immediately as their public transport system comes beside the term ‘Schweinerei’ in the dictionary, but for me it is amazing to use a system which is so frequent, so seldom unreliable and so cheap; Germans, picture this: at home I have a single bus which takes me to my nearest town once every hour or sometimes half hour, and it costs me almost £5 for a return journey on said disappointment. Not to mention the fact that each of the stations has somewhere to sit and somewhere where you can get coffee or a Ritter Sport. – The general honestness and easiness of the people here. In the UK one is choked by the neuroses it is your duty to suffer every time you are asked to an event you don’t want to attend or feel obliged to swallow down a vile dish someone has cooked for you or requested to do a favour you would rather sandpaper your eyelids that fulfil. In Britain I bend over backwards to keep people happy and keep life smooth; I cheerfully smiled when people drunkenly leapt through the library fire escape by my room door and thus made the whole building be evacuated, I apologised when people stamped my toes into pulp and I always, always, always ate what was on my plate even when in a restaurant so as not to cause any kind of awkward pall over the evening. Here you don’t do what you don’t want to do and you simply avoid social agonies by being honest and open, you admit what does not appeal to you and suggest a solution or an alternative and generally it works very well. You can tell people what you really think and you can have a debate in which you are clear about your own standpoint on the issue without people thinking you are flagellating all their beliefs and ethics by doing so. I haven’t experienced peer pressure once and I have cried and told my problems to a total stranger at the bus stop. I feel, in a way, that I have grown.